An awards celebration on the final day of the 2013-14 school year honored eighth grade students at Phoenix’s Emerson J. Dillon Middle School for various achievements and academic accomplishments. An Outstanding Academic Achievement Award was presented to 15 eighth grade students in recognition of earning Gold Star Honor Roll status during all four years at the school. Pictured are five of the honorees, left to right: Catherine Musumeci, Alisa Trudell, Haley Stellingwerf, Emily McDonald and Hannah Grabowski. Teaching staff recognized students for enthusiasm, effort and excellence in the following subject areas: math, science, English language arts, social studies, art, technology, family and consumer science, foreign language and band. 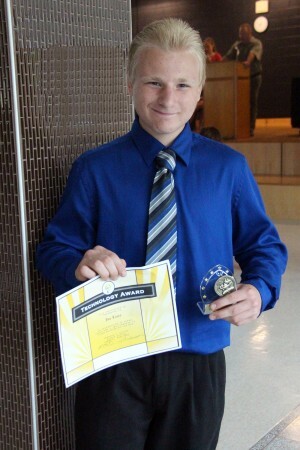 Eighth grader Joseph Lacey was presented with the Kevin E. Kon Technology Award, recognizing him for his ability to “think outside the box” and have fresh ideas, and the Century Club, in conjunction with the Phoenix Public Library, presented Alyssa Goudy with the Emma Pendergast Reading Award. Principal Sue Anderson was given the distinct honor of presenting two awards on behalf of President Barack Obama, The President’s Award for Outstanding Academic Achievement and The President’s Award for Outstanding Academic Excellence. 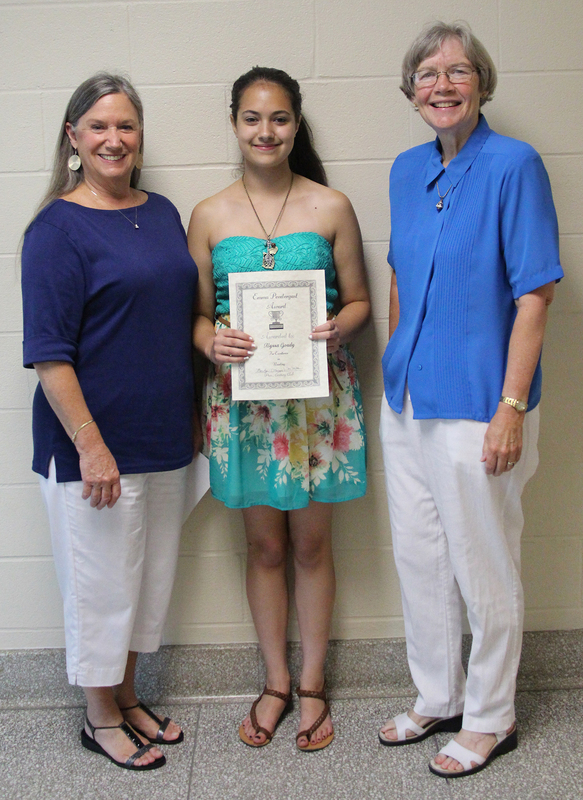 The Century Club, in cooperation with the Phoenix Public Library, presented eighth grader Alyssa Goudy with the Emma Pendergast Reading Award. Pictured with Goudy is Century Club members Barbara Henderson, left, and Mazzie McMillen. The President’s Award for Outstanding Academic Achievement recognizes students who show educational growth, improvement, commitment or intellectual development in their academic subjects. This award was presented to: Mikalah Bell, Emily Bell, Julie Daubek, Victoria Dievendorf, Jonathan Downing, Devin Dubovik, Becka Fuller, Brandon Germain, Trinity Green, Bradlee Hess, Brittney Hunter, Corinne Janusz ka, Joseph Lacey, Nina Lewis, Gabriella Liberty, Kali Livingston, Frank Palmer, Lawrence Pilon, Ryan Shafer, Zachary Tulowiecki, Jerrett Williams, Jordan Williams, and Kolbey Young. The President’s Award for Outstanding Academic Excellence recognizes students for meeting the highest possible academic standards. Recipients must have earned at least a 90 overall average for three and one-half years at EJD Middle School and also demonstrated high achievement in reading or mathematics on the New York State exams. This award was presented to: Dixon Ameele, Andrew Avery, Jordan Cole, Gabrielle Crandall, Alyssa Goudy, Hannah Grabowski, Morgan Gravlin, Natalie Hart, Zoe Heckert, Alexandra Hoag, Megan Maestri, Emily McDonald, Breanna Mitchell, Ethan Murakami-Hamm, Catherine Musumeci, Bailey Otter, Lauren Schmidt, Alexis Smith, Brianna Squier, Haley Stellingwerf, Alisa Trudell, Ben Vienneau, Kaitlin White, and Julianne Yates. 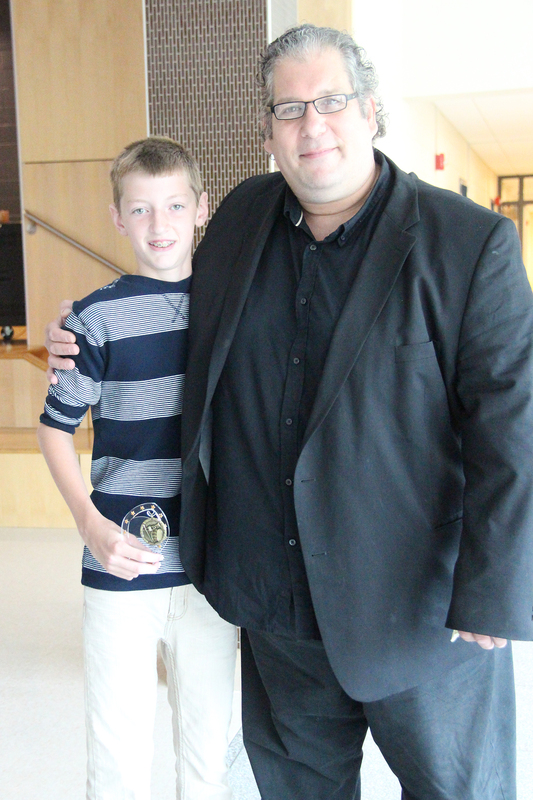 In recognition of his excellence in music, Dixon Ameele was presented with a Jazz Award by music teacher Jim DeMauro. In addition, 15 students were presented with an EJD Outstanding Academic Achievement Award and a Phoenix Firebird fleece blanket. This award recognizes students who earned Gold Star Honor Roll distinctions, a grade point average of 90 or higher with no incompletes or failing grades, for all four years at EJD. Honorees include: Dixon Ameele, Jordan Cole, Hannah Grabowski, Morgan Gravlin, Natalie Hart, Alexandra Hoag, Megan Maestri, Emily McDonald, Catherine Musumeci, Alexis Smith, Brianna Squier, Haley Stellingwerf, Alisa Trudell, Kaitlin White, and Julianne Yates. The final set of awards during the ceremony recognized the following students for four years of perfect attendance: Joseph Lacey, Alexis Smith, Trevor Worden, and Paul Zogg. Each honoree received a Phoenix Class of 2018 T-shirt and a Nice ‘n Easy gift card. Joseph Lacey was presented with the Kevin E. Kon Technology Award in recognition for his creative thinking and fresh ideas.